Native Philadelphians know that there's more to the city's culinary traditions beyond pretzels and cheesesteaks. 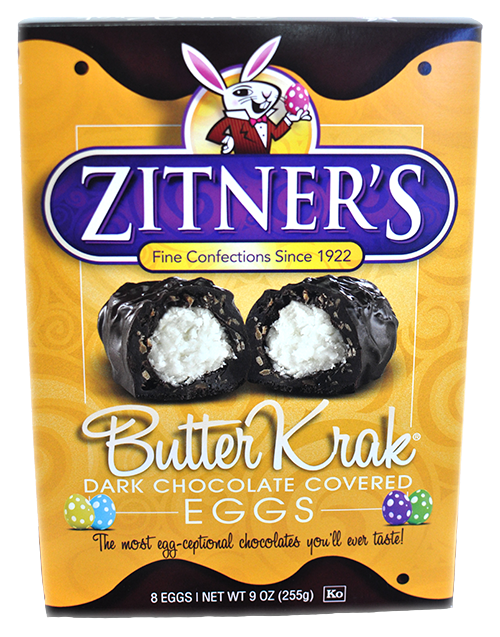 For nearly 100 years, Zitner's has produced and sold confections locally. 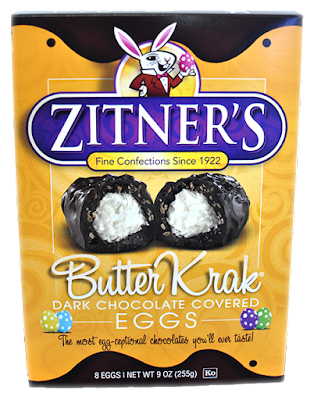 A few months before every Easter, its Butter Krak Eggs and other egg varieties - all gluten free - appear in area markets and convenience stores. Butter Krak Eggs, the most well known version, are made with butter cream and long thread coconut, enrobed with dark chocolate that's blended with toasted coconut. Other varieties include Peanut Butter Milk Chocolate, Butter Cream Dark Chocolate, Double Coconut Dark Chocolate, Coconut Cream Dark Chocolate and Marshmallow Dark Chocolate. 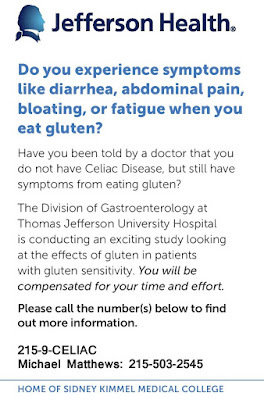 One of Zitner's owners is gluten free, and the company maintains a protocol to ensure safe manufacturing practices. 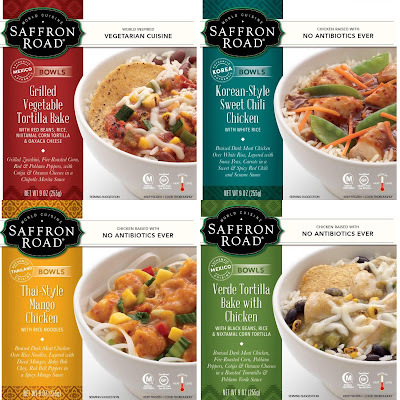 Evol Foods has expanded its line of certified-gluten-free options with three new enchilada varieties: Chipotle Chicken & Uncured Bacon, Carnitas & Salsa Verde and Cilantro Lime Chicken. 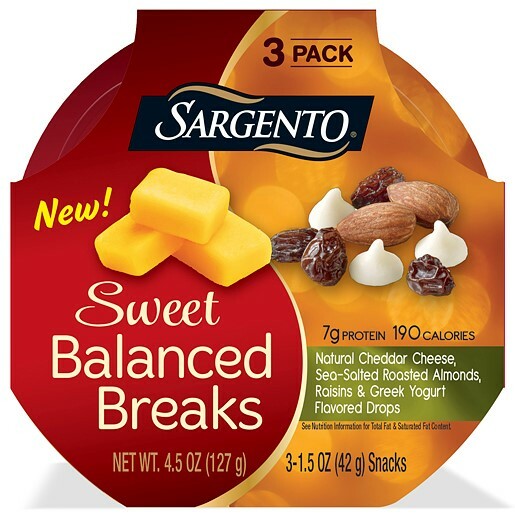 Three of the four new Sweet Balanced Breaks from Sargento are gluten free. They include Natural Cheddar Cheese, Sea-Salted Roasted Almonds, Raisins and Greek Yogurt-Flavored Drops, Monterey Jack Natural Cheese, Dried Cranberries and Dark Chocolate-Coated Peanuts, and Monterey Jack Natural Cheese, Dried Cranberries, Dark Chocolate Chunks and Banana Chips. The snack packs, which combine natural cheese with dried fruits and dark chocolate,.feature 5-7 grams of protein and fewer than 200 calories. Quick - think of a food associated with San Francisco. Survey says: "Sourdough Bread." When I heard about Bread SRSLY, a small Bay Area business devoted to baking gluten-free sourdough loaves, I couldn't pass up the opportunity to order such an elusive find. I'm glad I did. Bread SRSLY makes four kinds of gluten-free sourdough loaves - Classic, Seeded, Kale and Sweet Onion - along with sandwich and dinner rolls in a dedicated facility. In addition to being certified gluten free, all Bread SRSLY baked goods are also free of preservatives along with egg, dairy, nuts and other allergens. It's not, however, taste free. Our Classic Three-Pack order ($35) was shipped out on a Tuesday and delivered two days later via Priority Mail. Since the bread arrived chilled due to the cold weather, it was ready to be sliced right out of the package. The thicker slices I cut from the first loaf were moist - evidence that it was freshly baked. (The company says the the moistness extends shelf life and helps the bread to rise over a 12-hour period; refrigeration will firm up the loaves and allow for thinner slices.) My slicing yielded 12-13 slices per loaf, which keep for about a week in the fridge or about a month in the freezer. The bread was satisfying even without being warmed, but was superb out of the toaster (the recommended preparation), coated with a pat of butter. It's become our son's favorite for sandwich making. 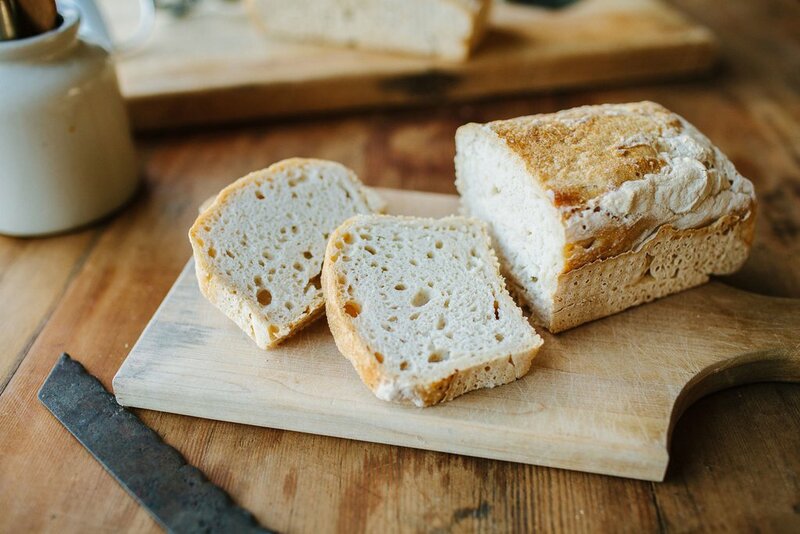 The starter, made with wild yeast, infuses the bread with that unmistakable tang associated with sourdough. The toasting accentuates the crispiness of the crust and softens the doughy interior. While priced higher than other gluten-free breads, Bread SRSLY's small-batch sourdough loaves are a worthy indulgence, particularly if you're craving an chewy, crusty bread that can't be found at the supermarket. New customers can use promo code WELCOMESRSLY at Bread SRSLY's online store for free shipping on their first order (a $5 savings). Disclosure: I receive a commission from purchases made through the affiliate links in this post. 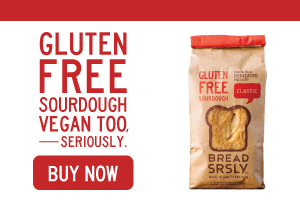 However, I purchased the bread independently and the opinions expressed in the post are my own and are not affected by my affiliate relationship with Bread SRSLY. 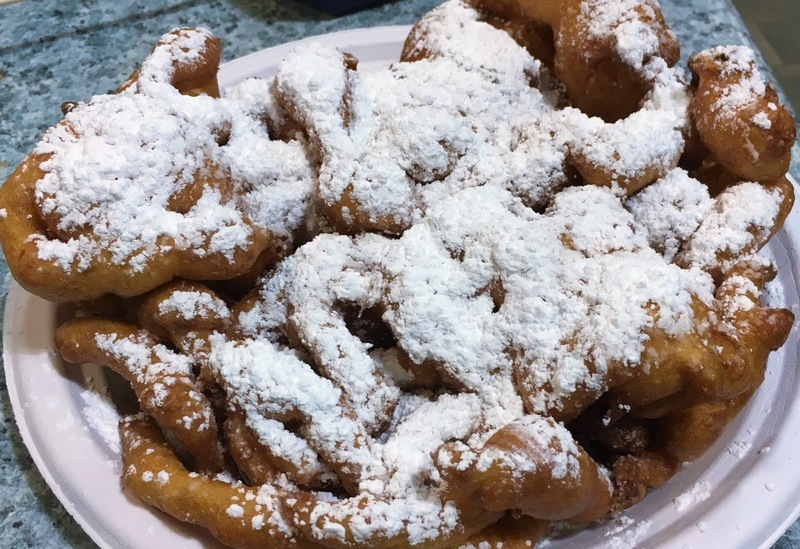 Corn dogs and funnel cakes are now within reach without traveling to the Jersey Shore. 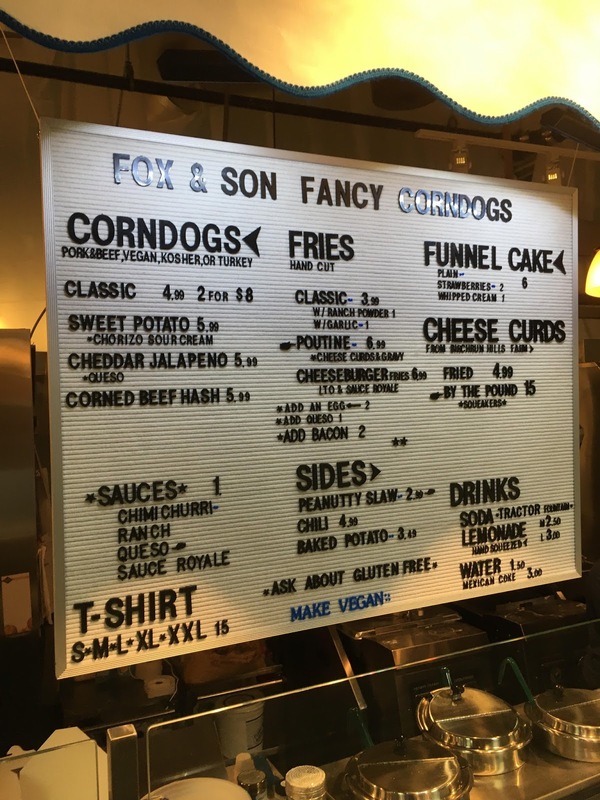 The just-opened Fox & Son (512 N. 12th St., 215-372-7935), has brought these fried delicacies to Philadelphia's famed Reading Terminal Market. Even better, the menu is entirely gluten free and all items are made to order. My son and I made a quick jaunt into the city over the weekend just to check out the stand, located toward the back right of the market (intersection of aisles C and 4). For starters, there are four different kinds of dogs to choose from: pork and beef, turkey, kosher and vegan. 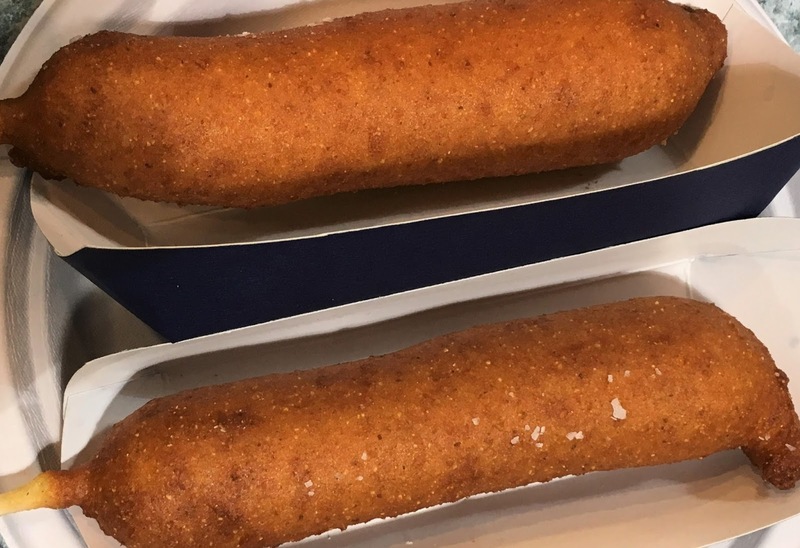 We opted for the kosher Classic ($4.99 or two for $8), but the corn dogs also can be dressed with corned beef hash, cheddar jalapeno or sweet potato, chorizo and sour cream ($5.99). The sweet corn flour coating was the perfect complement to the salty beef stick. 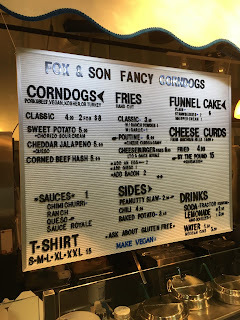 For early birds, Fox & Son has a breakfast corn dog, made with sausage and topped with maple syrup. 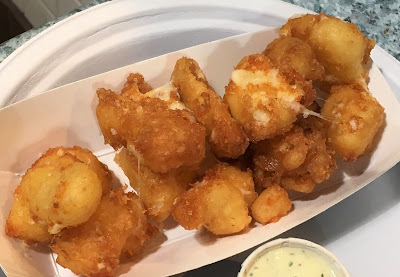 We shared orders of poutine ($6.99), fried cheese curds and, of course, funnel cake. Poutine is a Canadian staple: a basket of French fries topped with cheese curds and gravy. Fox & Son's sauce was very much to our liking, more of an au jus than what you'd find at a Thanksgiving feast. The gooey, deep-fried cheese curds ($4.99), made locally at Birchrun Hills Farm, are served with a side of addictive ranch dressing. Ah, the funnel cake ($5.99). Topped with powdered sugar and made with rice flour, it's doughy, sweet and melt-in-your mouth delicious. We chased our meal with organic blood-orange fountain sodas from Idaho's Tractor Soda Co.; other flavors are available, as is fresh-squeezed lemonade and Mexican Coke. 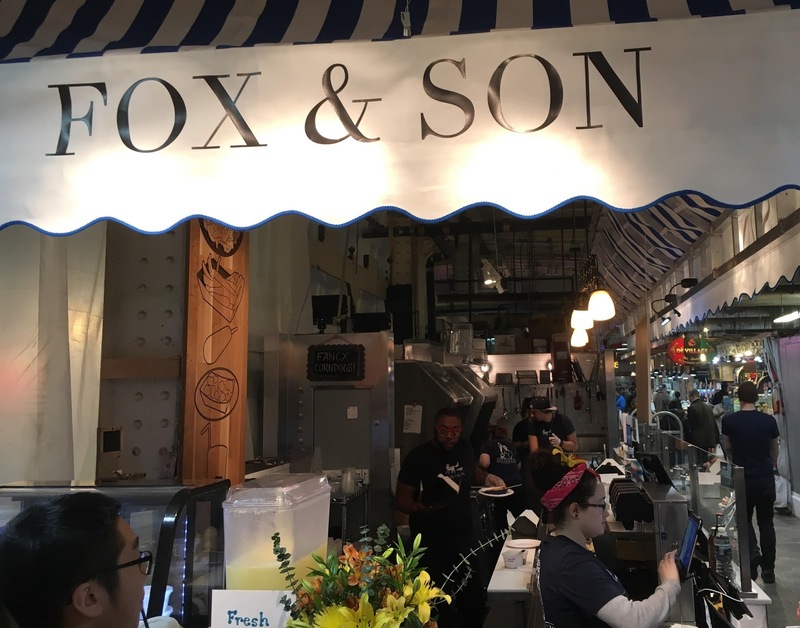 Though several other merchants at the market offer gluten-free options, none have the variety or novelty that Fox & Son brings. My son was ecstatic to be able to enjoy foods he'd never had before in the comfort of a dedicated gluten-free eatery. With its proximity to the Pennsylvania Convention Center and Old City, Reading Terminal Market attracts many out-of-town visitors, but tourists and denizens alike should make their way to Fox & Son for a taste of the boardwalk any time of year. Feel Good Foods, whose gluten-free product line includes Asian appetizers like egg rolls and dumplings, is expanding to Mexican tapas. 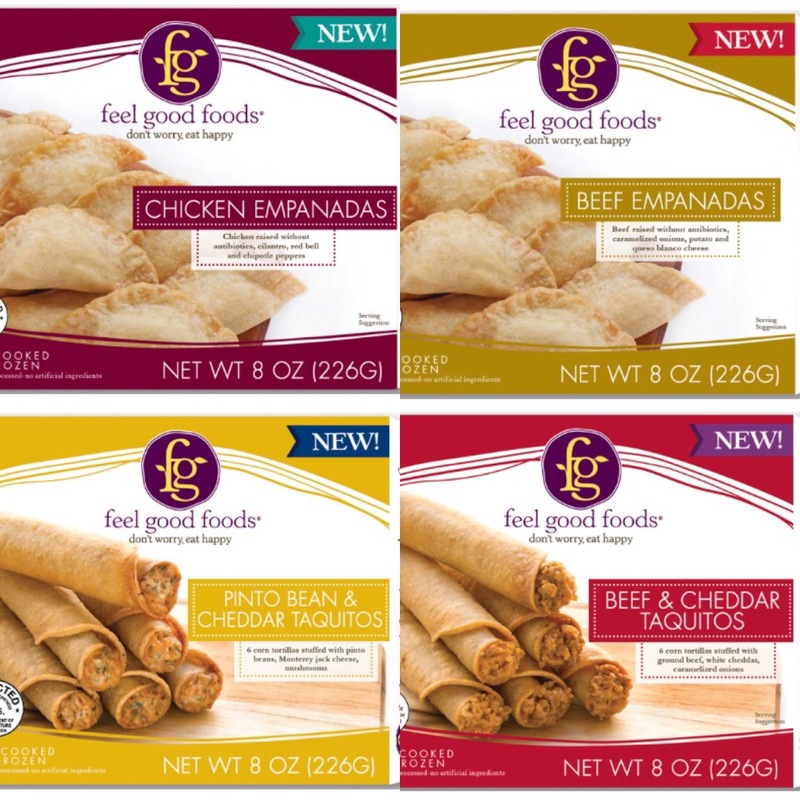 The newest items are beef, chicken and vegetable empanadas and chipotle chicken, beef & cheddar and pinto bean & cheddar taquitos. Saffron Road's newest World Cuisine frozen bowls, slated to debut in April, come in four varieties: Grilled Vegetable Tortilla Bake, Verde Tortilla Bake with Chicken, Thai-Style Mango Chicken, and Korean-Style Sweet Chile Chicken. Product coupons are available at the company's website. 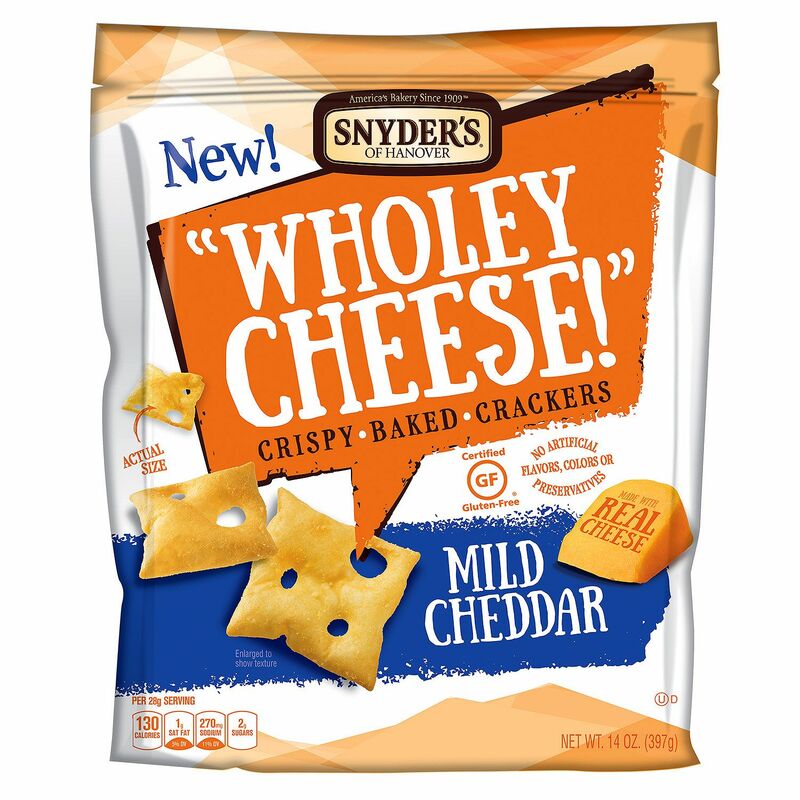 Look in the supermarket snacks aisle for Snyder's of Hanover's new Wholey Cheese baked crackers. They come in Mild Cheddar and Smoked Gouda flavors. If tradition holds, the roller-coaster January weather the East Coast experienced will soon segue into a more predictable pattern in February and March. That is likely to bring snow, which means greater opportunities for skiing and snowboarding. Many of the region's mountain resorts offer gluten-free options for those respites between runs. 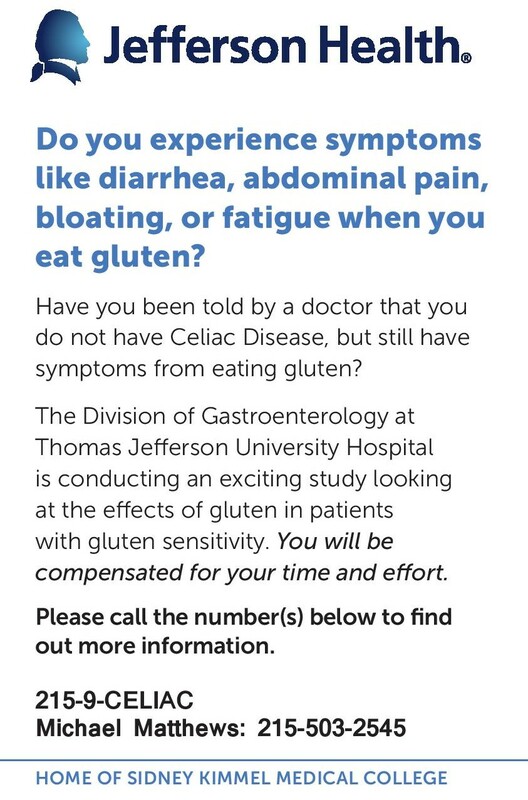 Gluten-free options are available in all dining areas at Shawnee Mountain, located in East Stroudsburg, Pennsylvania, about a two-hour drive from Philadelphia in the Poconos. 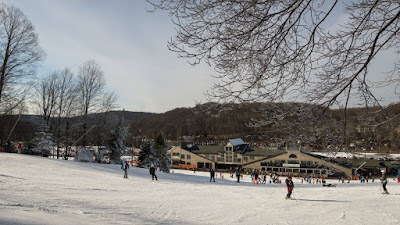 Tannersville's Camelback Mountain, also located in the Poconos, offers many gluten-free items in the Big Pocono Family Eatery, Cammello’s, East Side Bistro, CBK Lodge, Glen Lodge, Tubing Snack Shack and Cameltop Mountain Lodge. These include chicken breasts, hot dogs, pizza, BBQ chickens and salads. At Jack Frost & Big Boulder in Blakeslee, Pennsylvania, gluten-free options such as chicken fingers, burgers, hot dogs, burgers, fries, chili and salads are available; be sure to speak to a JFBB Food & Beverage staffer before ordering. In nearby Scranton, the Slocum Hollow restaurant at Montage Mountain can accommodate gluten-free requests. 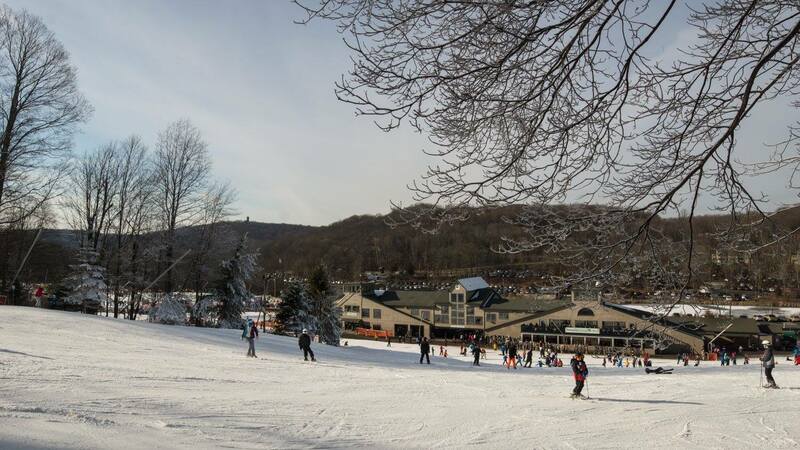 In the Lehigh Valley area, Slopeside Pub & Grill at Blue Mountain in Palmerton has a gluten-free menu that includes sandwiches and mac-and-cheese, while Bear Creek Mountain in Macungie can provide gluten-free meals at The Grille, a full-service restaurant. For skiers willing to drive a bit further to get their snow fix, Hunter Mountain in Hunter, New York (about a 3 1/2 hour drive from Philadelphia) has gluten-free menu items at several dining locations. At Van Winkle's, the gluten-free menu includes pizza, salads and entrees.